Yesterday we posted this silly video about playing Wind-up Knight 2 with a variety of funny controllers. Nothing in this video is faked; we used a converter box (like this one) to convert our various console controllers to USB, then a OTG USB-to-Micro USB adapter (like this one) to connect the box to an Android tablet (in this case, a Sony Xperia Z, though this should work with any modern Android device). Most standard controllers will just work, but this collection of weirdo devices requires a little bit of button mapping (usually just two keys), which we have a simple setup screen for. 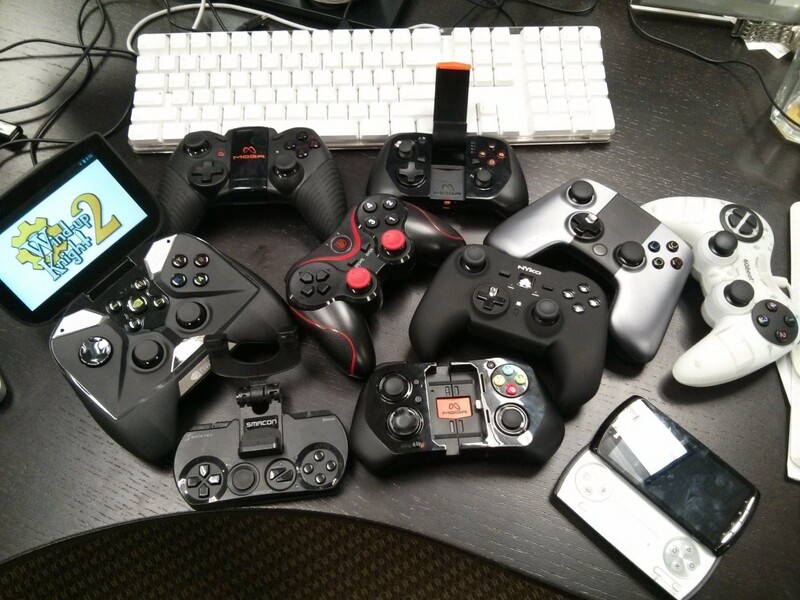 We had fun making this video, but it also forced us to ensure that our controller support was complete. If you can play Wind-up Knight 2 with a Guitar Hero controller, I’m pretty confident that you’ll be able to play with any standard mobile controller that might be released in the future. And because we had this infrastructure in place for Android devices, adding support for iOS7 controllers took us about five minutes. Controller support is important to us because there are entire genres of game that are difficult to translate from fingers-on-a-button to fingers-on-glass. We’ve worked hard to make Wind-up Knight have tight, reliable touch screen controls, and there are plenty of games on mobile devices today that could never be made with a traditional controller. But there’s also 30-odd years of game design behind sticks, d-pads, and buttons, not to mention a generation or two of people who know how to play games this way. Our interest isn’t in competing with console games–we love our PlayStations and Xboxes. Rather, we want to leverage the extreme ease of development and distribution that mobile platforms enjoy to make crazy controller-based games. We fondly remember the short-lived Dreamcast golden era, when all kinds of wacky, innovative titles were readily available, when the cost of development was still low enough that experimentation was abundant. These days, if you want to play a jaw-droppingly beautiful FPS, you should probably do it on a console. If you want to kill five minutes while you wait in line for coffee, your phone’s got you covered. But what if you want to play something like Power Stone 2, or Jet Grind Radio, or Cannon Spike? Some games from that era have actually been released for mobile platforms and while they look great, they are neigh-unplayable. I believe that controller-based games distributed as apps to devices based on mobile hardware could give us access to that sort of golden era again. I don’t know if controller-based mobile games will gain enough traction to become a big deal, but I sure hope that they do. Whether it’s controller peripherals for phones and tablets, TV-based devices with mobile hardware like the OUYA, or dedicated portable gaming devices like the SHIELD, we want to be prepared to deliver the best possible play experience. And after playing Wind-up Knight 2 with my old Dreamcast controller, I am happy to report that it feels pretty rad. This entry was posted in Android, controllers, game design, game engineering, iOS, mobile games, wind-up knight. Bookmark the permalink. no, wait, I went to a wedding in San Antonio once.